Drank not a drop Sunday or Monday. In this economy, as is the catch phrase, a two-day hiatus deserves a reward. Since I'm a hop guy, I decided to try a couple of the hoppier options in my collection. 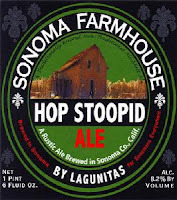 First, the Lagunitas Hop Stoopid. Lagunitas, as of a year ago, was fairly limited in Minnesota. Or maybe I just wasn't noticing them. Recently, however, their brews have been popping up everywhere. I liked the IPA, was lukewarm on the Brown Shugga, and could not handle the Maximus IPA. The Hop Stoopid was the best of the bunch so far. The aroma represented everything I love about juicy hopped-up beers. The pungent citrus, in this case grapefruit and a strong passion fruit presence, gets me revved up to swig. I really took a deep sniff at this one, because I knew I grabbed something specific (the passion fruit), but it took me a while to realize exactly which of the 'fruit cocktail' canned fruits it was. For once, I knew I had a smell nailed, and it comes from 2.5 years at a preschool. Good-sized head on this one, with the lacing disappearing more than some. Looks like orange jello, which again, I can attribute to preschool experience. The taste was exceptional. Big and sturdy on the front end, with the citrus holding sway. The key, though, was the back, when everything felt like it was being sucked out of your mouth and down the hatch via the bitterness. My mouth was full one second and dry, sticky and empty the next. I love that in a beer. Give me some boom right away, take it away and leave me wanting more at the end of every sip. This beer is sharp like a nasty cheddar cheese. As the glass emptied, I felt a bit more metal in every taste, but I think that had more to do with the compounding bitterness than the deterioration of the beer. Overall, this was one of the more satisfying beers I've had this year. I'd put it at the top of the hops, at least. Next, Founders Centennial IPA. This much-heralded brewery does not sell its beers in Minnesota, and I am ashamed that it took me this long to cross the border into Wisconsin to buy some. Oh, the places you'll go! (Dr. Seuss' birthday yesterday). 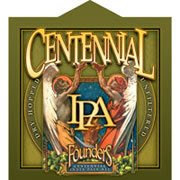 Nearly all Founders brews come highly recommended, and Centennial is no different. To be fair to the Hop Stoopid, I should have opened the Founders Double Trouble, but I wasn't sure I could handle another double IPA. Unfortunately, the Centennial IPA couldn't match Hop Stoopid's power. Lately I've been tasting a lot of what I can describe no better than dust. It tasted dusty. Maybe that means the flavors weren't as clear or crisp as I'd like. Maybe that means the mouthfeel was a little fuller and stretched farther into the buds than most. Or maybe it means that I got a peculiar amount of mothballs in the flavor. I swear I tasted mothballs. Don't misconstrue those words. Mothballs, yes, but the flavor was still good. Still. I'm finishing the glass as I write, and the dust factor overpowers everything else. I wish I could express it better. I guess I'll have to head east again, but a couple more bottles, and try them next to a more favorable competitor. In fairness, it probably would have stacked up well next to the Lagunitas Maximus, and maybe even the Lagunitas IPA. It just couldn't hang tonight. wow, just so many beers to sample---I can't imagine trying to keep up! every one sounds intriguing.